That’s what an international team of researchers set out to answer about the big-nosed, long-faced Neanderthals, the extinct human species that has been synonymous with “caveman” since the first fossils were found in the 19thCentury. By making the first full reconstructions of Neanderthal skulls and investigating the natural engineering of those structures using 3-D modelling and computer-based engineering, the team has determined that these robust humans probably expended huge amounts of energy in pursuit of an extremely active lifestyle. The conclusion was arrived at by carefully discounting a competing theory about Neanderthals having massive bite force, and developing compelling new evidence that their nasal passages were capable of both conditioning and channeling large volumes of air in and out of their lungs. 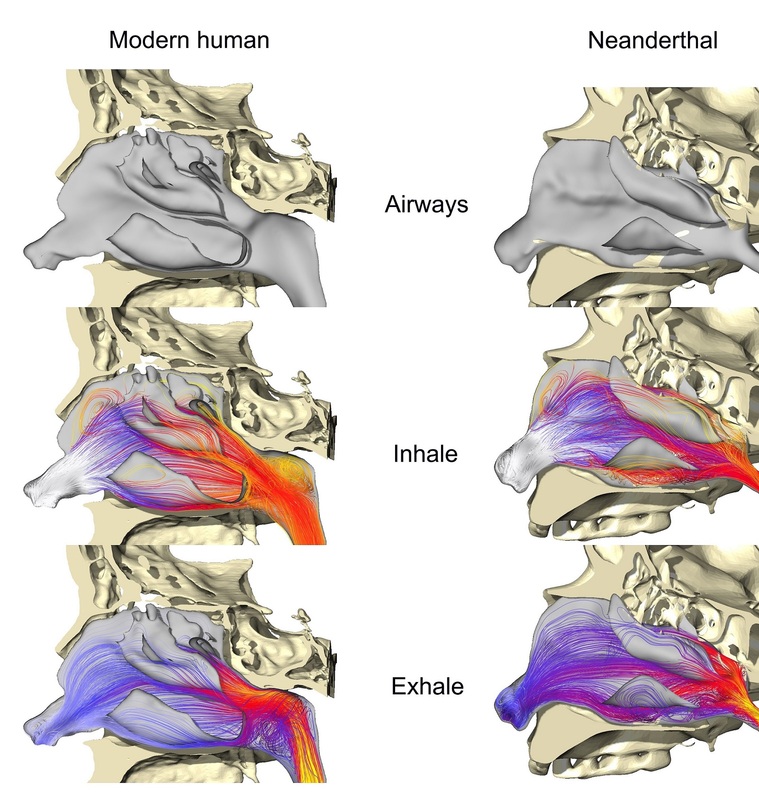 Comparison of air flow through the nasal cavities of Neanderthals and modern humans. “In this respect, Neanderthal breathing was almost twice as effective as it is in we modern humans,” said the team’s leader, University of New England zoologist Professor Stephen Wroe. In a paper published today in Proceedings B of the Royal Society of London, Professor Wroe’s team detail how they used new methods to examine competing theories about the evolutionary purpose of the Neanderthals’ long face. They built the first three full model reconstructions of Neanderthal skulls, including the more perishable material of the nasal cavity, which only rarely survives the fossilization process, and compared those skulls with those of modern humans and skull reconstructions of a likely human ancestor, Homo heidelbergensis. By using mechanical engineering simulations to model the ability of each species to sustain high bite forces, they ruled out a theory that Neanderthal skulls had evolved into their distinctive form to give these ‘archaic’ humans a more powerful bite. 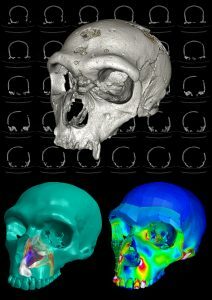 But then the international research team examined the Neanderthals’ big nose – or more specifically, the cavities that lay behind it – using finite-element analysis (FEA)and computational fluid dynamics (CFD), and discovered some profound differences. The analysis was helpful in showing that although Neanderthals were more effective at warming and humidifying incoming air than the more primitive Homo heidelbergensis, they were not as effective at warming cold air as modern humans – regardless of whether the modern humans were from cold or hot climates. This still means that Neanderthals were better adapted in this respect than their probable ancestor. But in one respect, Neanderthals were unique. When compared with the more’primitive’, Homo heidelbergensis, and a range of modern humans (for rigour, the analysis covered Inuit and other hunter-gatherer skulls, including a modern human fossil from the Ice Age) the Neanderthals clearly excelled at getting air in and out of their bodies through their noses, fast. 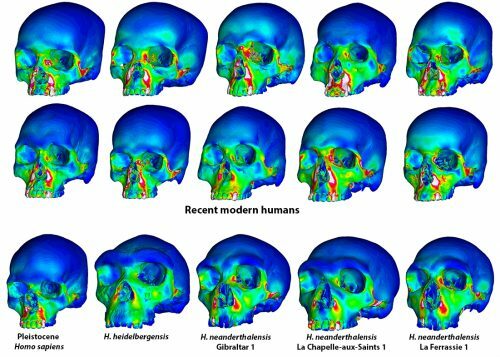 Modelling of a reconstructed Neanderthal skull that allowed analysis of breathing and biting capability. The finding illuminates an intriguing point of difference between two human species at a time when old ideas about difference are being brought into question by new discoveries. The 19thCentury discovery of Neanderthal fossils gave rise to the original concept of the primitive caveman: dimwitted, brutish, and inferior to modern humans in every way that mattered. Prof. Wroe says that a steady sequence of discoveries over recent decades has shown that in our conceit, we’ve been selling Neanderthals short. The caveman’s cultural legacy is very similar to ours. 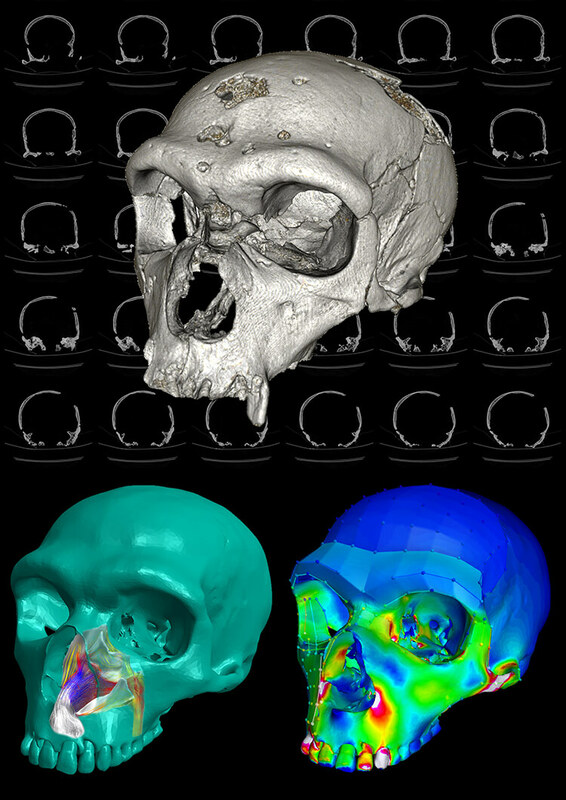 But the new study of reconstructed skulls – undertaken by scientists from Australia, the United States, United Kingdom, Germany and Italy – indicates that the living Neanderthals would have been otherwise readily distinguished from our own species not just from the appearance of their long faces, but the physical endurance and behaviour that those long faces and big noses supported. Unfortunately, Prof. Wroe says, exactly how the Neanderthals used their immense capacity to harvest and expel oxygen is not preserved in the fossil record. Like so much of early human life, we have to fall back on imagination and wonder what it was like to see Homo neanderthalensisthrough the eyes of Homo sapiens.